Varying reports reveal that “tens of thousands” of individuals died in Europe in the 2003 heat wave with 15,000 in France alone. Reporting today still use the inaccurate estimates from the day. The European Union sponsored a study that laid to rest the speculation but this study’s results are so astonishing the numbers are still not used today. Even this work on heat waves only says “tens of thousands died.” But the EU study has weight. It tells us 70,000 died that summer relative to the number of “normal” deaths from 1998 to 2002 and that in addition, there were another 10,000 excess deaths during the rest of the year totaling 80,000 deaths from the 2003 heat wave. Researchers at the UK Met, Great Britain’s National Weather Service, have calculated the odds of extreme heat events happening again. Using data from the ten years since the 2003 European heat wave they they tell us that the likelihood of extreme heat waves that happened every fifty years in the 20th century, the 50-year heat wave or an event that would normally happen twice a century, are now expected to occur twice a decade. 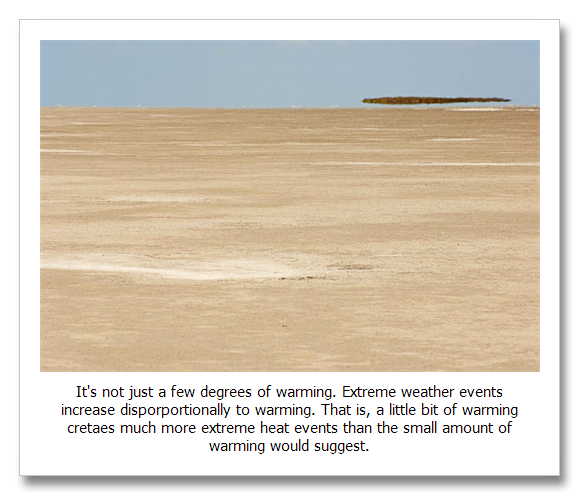 The ultra extreme heat waves represented by the 2003 European event, that normally happen once in thousands of years now will happen about every hundred years. This evaluation also does not peer into the future. It is based on our climate now—or as it was in 2013. Christidis et al., Dramatically increasing chance of extremely hot summers sine the 2003 European Heat Wave, Nature Climate Change, December 8, 2014. Robine et al., Report on excess mortality in Europe during summer 2003, 2003 Heat Wave Project, EU Community Action Programme for Public Health, Grant Agreement 2005114, February 23, 2007.